Ubisoft has revealed details of the Watch_Dogs 2 Season Pass which is available as part of the Gold Edition of the game. Players will be able to continue their hacker journey with several hours of additional mission content including new co-op challenges and difficulty levels, outfits, vehicles and lots of customization items. Each downloadable content will be available with a 30-day exclusivity for PlayStation 4 owners. Players will get the style and the swagger of legendary hacker Raymond “T-Bone” Kenney with his truck and outfit, and discover Mayhem, a new co-op difficulty level that will pit players against a new enemy archetype armed with advanced weaponry. (Available on December 13th on PlayStation 4). Through several hours of additional mission content in three new world stories, players will uncover San Francisco’s biggest scandals on the cutting edge of science, medicine and misuse. In Human Conditions, players will also experience new elite co-op missions and face a new enemy type: Jammer, with the technology to hunt players down. (Available Spring 2017). Players will experience an all-new world story which mixes Marcus up in the seedy underbelly of San Francisco and puts him in the crosshairs of the Russian mafia. Also includes a new co-op mode: Showd0wn, where only the best players will survive. (Available Spring 2017). Customise Marcus’ outfit, weapon, drone and car in the grooviest style. (Available on Day One). 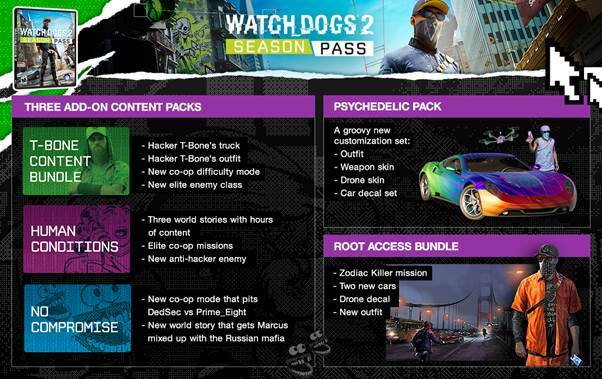 Includes full sets of outfits, new cars, a drone skin and a new weapon, as well as the Zodiac Killer mission. (Available this Winter).